In the summer I like to take my beauty routine down a notch. Less makeup. Less time. More focus on a few key products that make it look like I put a lot of time and effort into my look. Because of my rosacea, I don't have the luxury of skipping makeup all together. Last month, I found 4 key products that have allowed me to relax my routine considerably but still look good. For a 46 year old with rosacea and fine lines, primer is a MUST. I use it daily to help fill in the fine lines, even out my skin tone, and create a smooth, even base for my BB cream and foundation. What sets Skindinavia apart from other primers is that it's a spray primer. I spritz it on after I apply my moisturizer and allow it to dry, which takes about 30 seconds. During these warm weather months, this spray primer has, literally, been a refreshing change from conventional primers. This primer makes my skin feel noticeably smoother and does a great job of evening out my skin tone to tame down the redness. Skindinavia's ultra-fine mist makes my makeup last longer and diminishes fine lines. And talk about easy to use. You spray. It dries. You apply your makeup. Quick drying and easy to use are important to my overall beauty routine, especially in the summer months when I just want to get up and go. Skindinavia is light and breathable, traits I often find hard to come by in primers. Most are heavy and sticky in their attempt to conceal fine lines and even out skin tone. It has taken me a loooong time to master the art of liquid liner. It's incredibly tricky and requires a surgeon's steadiness. I have found that with the right liner, primarily the right brush tip, a liquid liner can be your best friend. The Skinny Mini liner from Eyeko is my new best friend. It glides on smoothly and evenly and dries quickly for clean, smudge-proof results. The thin, sturdy tip creates a smooth line that stays put for hours. Who doesn't crave some soft, natural beach waves in their hair in the summer? This salt-based spray adds volume and texture to create that sought-after windblown look that we long for all summer long. I spray it on my damp hair and split my hair into 2 braids and allow to dry. Once dry, I flat iron the braids and take them out of the elastics. This creates natural beach waves with little effort. I used to love dark, vampy lipsticks. But now I find myself drawn to more natural shades, ones that mirror the natural pigmentation in my lips. But finding the perfect shade can be a monumental task. I set out one Friday morning a few weeks ago to find a shade that added a tint of color but looked natural as well. After spending about an hour at the M.A.C. boutique trying on countless shades with the help of a very sweet and patient M.A.C. consultant, I finally found the one. I decided on "Modesty", and I have been wearing it daily ever since. I get so many compliments on the shade, and when paired with the "Staunchly Stylish" lip liner, the combination creates the perfect pair of lips. 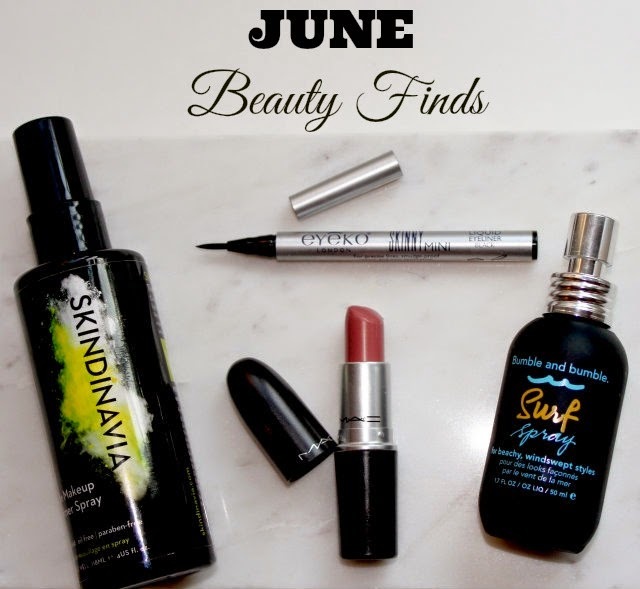 I'm linking up with Beauty Buzz hostesses Mom Trends, Musings of a Housewife, Mama in Heels, and Sassy Moms in the City. Hi Sheila!!! I'm so excited I found your blog! Can't wait to hear more from you! !